As the current northern hemisphere winter season has evolved we have witnessed pulses of storms and bad weather progress from the northwestern region of North America toward the east with some regularity. 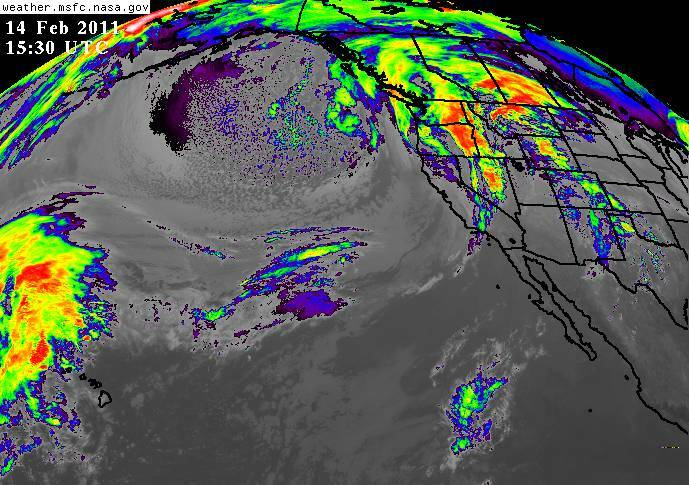 Often as eastern regions are digging from under heavy snowfall and activity-paralyzing winter storms, which bring pronouncements from old-timers of “never before having see anything like this”, a new storm is already forming as warm moisture-laden air from tropical regions over the Pacific collides with the arctic jet stream near the west coast of North America, generating plenty of precipitation over the western regions to then aim for the east. In monitoring these winter ‘happenings’ I have posted commentary and images about it, on Facebook and Twitter, which have motivated howls of “not another one, please! !” from some who follow such postings. For it would appear the regularity of these impacts, barely leave forever briefer periods of respite for those affected, seem to continuously cause cancellation of airline flights throughout vast regions and near paralysis of human activity in major urban centers throughout the country. Accompanying these winter activity are numerous questions: is this related to global climate change? Is it just normal, natural climate variability over the northern hemisphere? Does El Nino (ENSO) or La Nina have anything to do with this? Is this the worst we have seen? etc. etc. Without getting into the complexities of atmospheric physics and the various factors that may be contributing to the winter storm activity we are witnessing this season, I submit the “Pineapple Express”has been the main vehicle for such storms to move from their genesis over the central tropical Pacific, near the Hawaiian Islands, toward the western-northwestern coast of North America to then move on toward the eastern regions of the United States and Canada aided by the arctic jet stream. 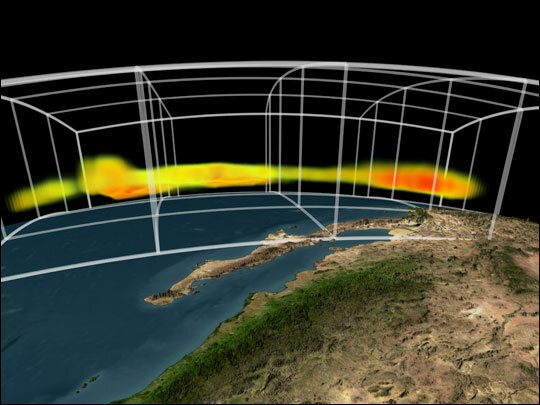 The best way to visualize the Pineapple Express is by imagining an atmospheric river of warm air, which holds a huge amount of moisture, as it moves from the central tropical Pacific Ocean generally over or near the Hawaiian Islands toward the east by northeast until it is ‘engaged’ by the southern fringes of the arctic jet stream, which carries it toward the western coast of North America and then overland toward the eastern coastline. 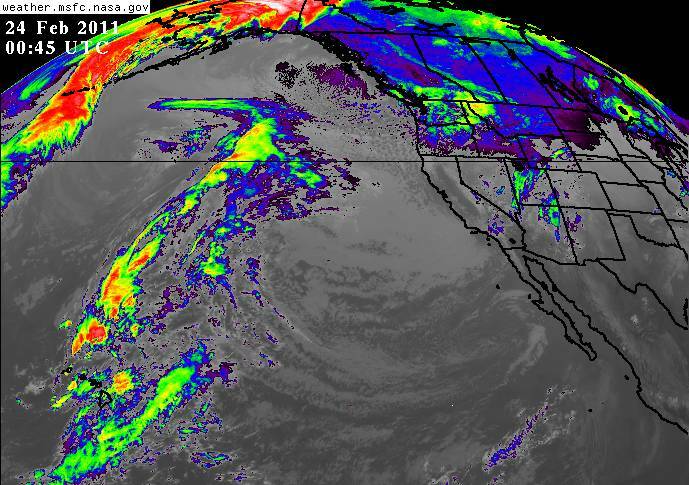 When this atmospheric river starts to collide with colder air over North America heavy precipitation in the form of rain and snowfall takes place along its path from west to east. Given the generally larger moisture content in the atmosphere, this has led to extreme snow fall and precipitation over vast regions of the United States this winter. We have all seen the media reports of thousands of flights cancelled, severe degradation of highway and rail travel, and the paralyzation of major urban centers suffering the impacts of winter storms. Empirical data appears to suggest this pattern of late winter extreme storms, which just as quickly yield to spring, may become the norm over the near term as global warming allows the atmosphere to hold more moisture (water), which then leads to extreme precipitation [snow, rain etc.] events. In tracking current winter activity I have used output from the geostationary satellites, namely GOES East and GOES West, which allows for a concurrent view of what’s happening over the Pacific Ocean all the way to the eastern regions of North America. A review of these data sets shows the each ‘pulse’ as it was generated over the Pacific, and it also allows one to track its progress and development as it hitches a ride on the arctic jet stream and interacts with masses of frigid air over North America. To focus on the Pineapple Express may be oversimplifying what is otherwise a complex atmospheric process where several other contributors are at play, such as the Madden-Julian Oscillation [MJO] and La Nina. However I believe it is important for the general public to highlight the effects of a major contributor to winter storm activity over North America, particularly during the current season.